Back cover blurb: Who is the lullaby girl? Battered, bruised and washed up on the banks of a remote loch, the Lullaby Girl doesn't know who or where she is. She doesn't speak. She only sings a haunting Danish lullaby over and over again. 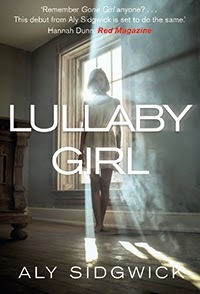 When her shocking story hits the headlines, the Lullaby Girl is hot news. Everyone wants to know who she is. Strangers donate money for her care, the media are breaking down the door to get to her and the care home she's in is struggling to cope. Then, as chilling memories slowly start to resurface, the Lullaby Girl begins to realise that her story isn't over and she is in mortal danger, with a past that is quickly catching up. But she needs to remember why before it's too late. Lullaby Girl is Aly Sidgwick's debut novel, and what a debut it is! Katherine, Katty, or Kathy is the Lullaby Girl, washed up in a remote Scottish Loch fighting for her life. After physically recovering she is taken to Gille Dubh care facility where the staff are eager for her to open up and tell them what she's been through. At first Kathy doesn't speak, just occasionally hums and sings a haunting Danish lullaby, which prompts the staff to start questioning her origins. They had assumed she was British, but now are convinced that she in Danish. At first it is only her name, and only to the one member of staff that she truly trusts; Rhona. Rhona is supportive of Kathy, patient, kind but brutally honest with her in a way that the others hard. She is sometimes cruel to be kind, when some of the other staff (particularly one individual) are just cruel! As Kathy begins to open up to Rhona, we learn why she sings a Danish Lullaby, why Magnus, Hans, and Lina are all names that cause certain terrifying reactions in her therapy sessions, and why she is reluctant to let the care facility help her find her family. the Lullaby girl is a very honest novel. It is a difficult read in that it deals with some particularly difficult and harrowing issues. But often these stories need to be told, and it takes a brave debut author to tackle them. Mental illness, pyschological abuse and depression are all handed sensitively and make for an excellent read. Highly recommended and I can't wait to see what the author has next up her sleeve! the Lullaby Girl is available to buy now from Amazon online and all good book shops.